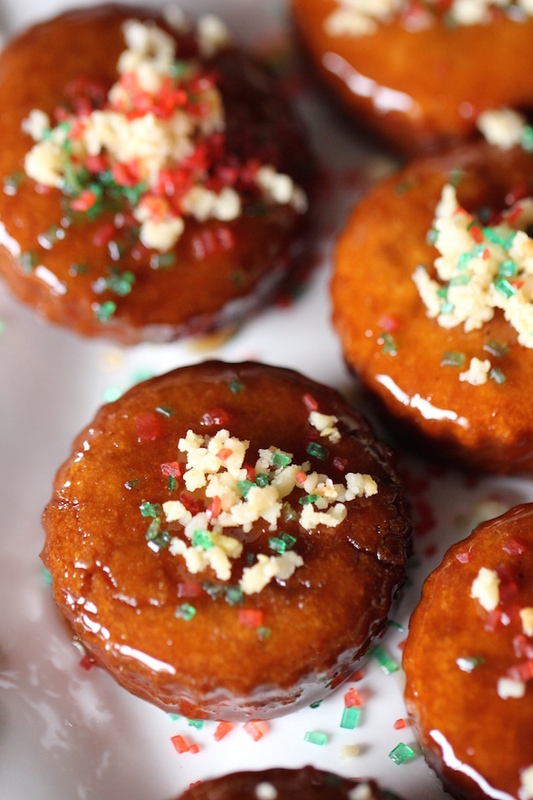 Looking for a different type of sweet treat to add to your holiday cookie repertoire this year? Try Korean yakgwa. 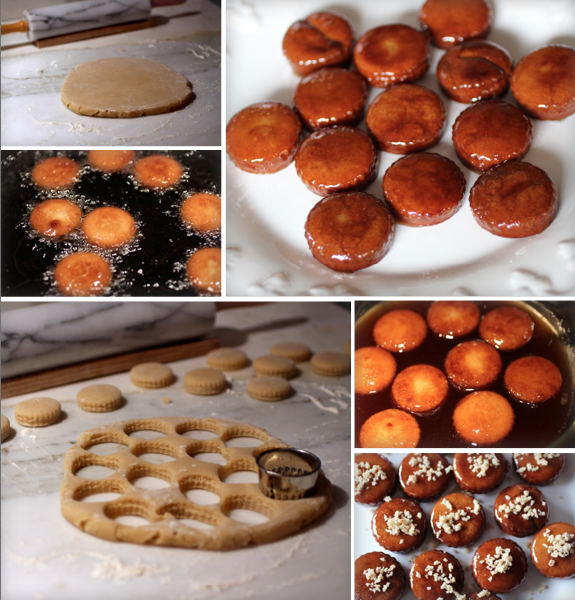 These fried cookies soaked in a cinnamon ginger syrup have a unique biscuit-like texture and are bursting with an unexpected flavor combination of toasted sesame oil, cinnamon, and ginger. 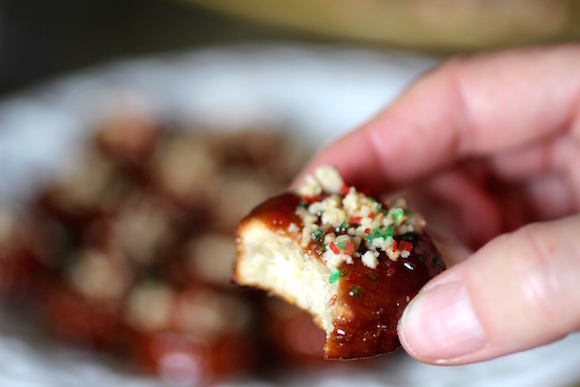 This time of year I sprinkle them with red and green sparkling sugars along with the traditional chopped pine nuts. 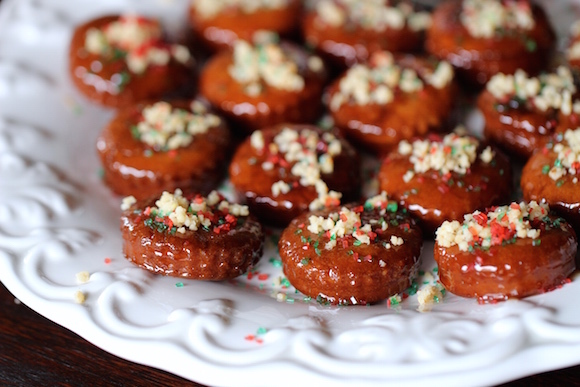 They are petite, super-sticky, and honey-sweet with an interesting savory element – and make a delightful addition to the Christmas dessert buffet. Aerate flour in the bowl of a food processor for 10 seconds. Add sesame oil and blend. Then add rice wine, honey, salt and pepper. Blend until well combined and the dough forms together into a ball, add ice water one tablespoon at a time if the dough is too dry to form a ball. On a floured surface, roll out the dough to a half inch thick, then cut out the cookies with a cookie cutter. Heat a generous amount of canola oil over medium heat. Fry the cookies until deep golden brown, turning occasionally. Transfer to paper towels. Meanwhile, combine all syrup ingredients in a small sauce pan and bring to a boil. Cook until the mixture becomes syrupy. Let cool slightly then pour syrup into a shallow bowl. Add the cookies. Let the warm cookies soak up the syrup. 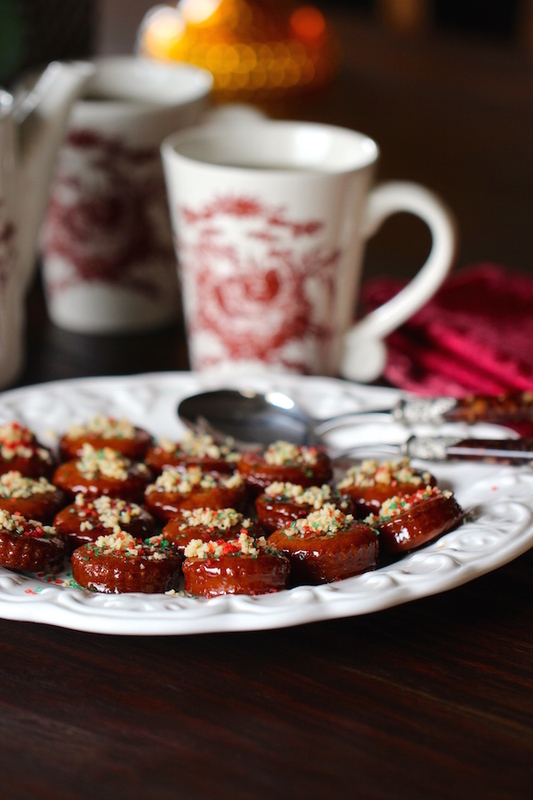 Place cookies on a serving platter and sprinkle with pine nuts and red and green sugars. 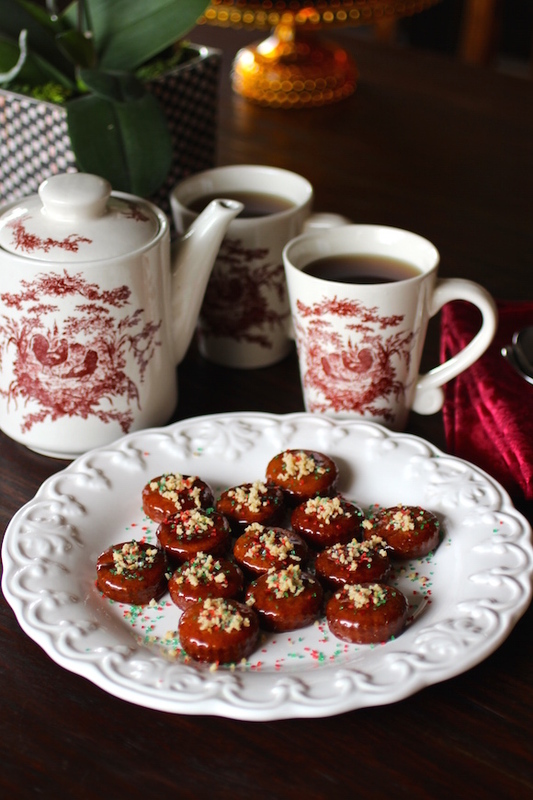 Serve these sweet treats with tea or coffee. Fall Fest is a season long franchise where Food Network editors team up with bloggers to share recipes about everyone’s favorite autumn dishes. Be sure to check out the Pinterest Board with over 200,000 followers called Let’s Pull Up A Chair! What interesting cookies. I have never heard of them, but I will never cease being amazed at how many cultures have a fried cookie dipped in honey. Thanks for posting this one. I love learning about new things.